Dispersed storage for reserve aircraft for Lee-on-Solent. The airfield lies 2 miles E. by S. of Midhurst and 1 miles ESE, of Cowdray Park, with the village of S, Ambersham adjacent W. The S. Ambersham - Selham road traverses the airfield. Petworth lies 3½ miles ENE. and Chichester 9 miles SSW. The ricer Rother, flowing through Midhurst to the Arun, Passes close to the airfield. The Southern Railway, running N, form Chichester, forms a "T" junction at Midhurst with an E/W line, the eastern arm of which forms the boundary of the landing area. Secondary road to the main Petworth road 1 mile N. and secondary toad to Midhurst and to Selham, ½ mile E. Southern railway stations at Midhurst and Selham. H/Q office on the S. side of the S. Amersham-Selham road which forms the N., boundary of the landing area. Irregular, grass surface; there is a steady slope up from N. to S.
The landing area is normally obstructed bur will be cleared fir landing on telephone request to Lodswotth 272. None. Aircraft are moved across fields to the Ditch Barns. Rising ground southward, with summit 764 ft. 2 miles SSW. Rising ground northward, with summit 626 ft., 2¼ miles NNW. Railway embankment on S. boundary. The E/W/ approaches are clear. Windsock near the centre of the E. boundary. Requisitioned buildings in S. Ambersham, 400 yds. W. of the landing area. Small armoury and store in S. Amersham. Small dispensary with one sick berth C.P.O. Small petrol store. Capacity 1,000 gallons in tins. 2.000 gallons. One 250 gallon bowser. WT, workshop and equipment store. Ammunition storef300 yds. W. of H.Q. office. Handled over 102 aircraft passed through the section, records list 16 Albacore, 12 Swordfish, 70 Walrus, 1 Sea Otter, 4 Reliant. Four Avro Anson aircraft operated out of Cowdray Park between April - October 1944. A station flight. appears to have been formed towards the end of the war, Stinson Reliant FL155 is recorded as being on the strength of Station Flight in 1945. 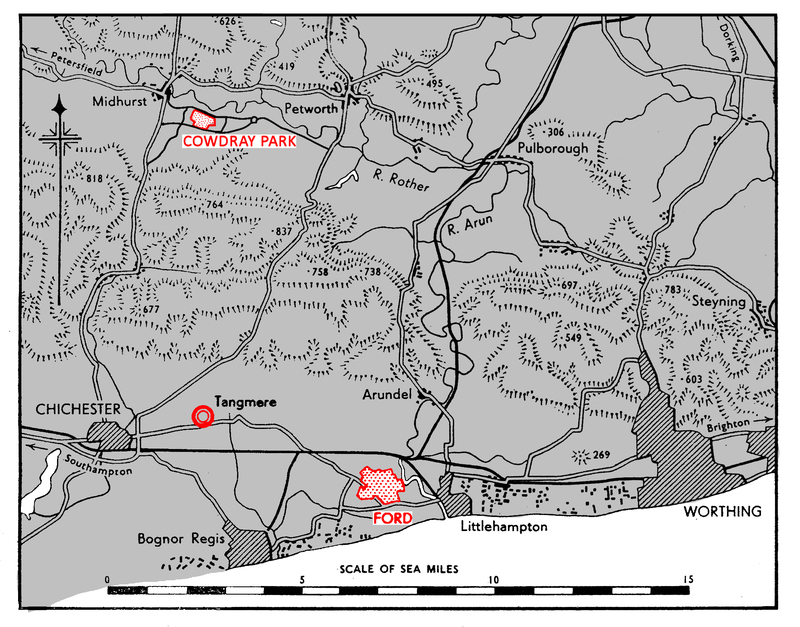 On March 28th 1941 the Admiralty requisitioned a portion of land from the estate of Lord Cowdray for use as an over-spill storage site for RNAS Lee-on-Solent. The site, normally a polo field, had been used as an occasional aerodrome, usually referred to as Midhurst or South Ambersham before the outbreak of war but had no permanent facilities. 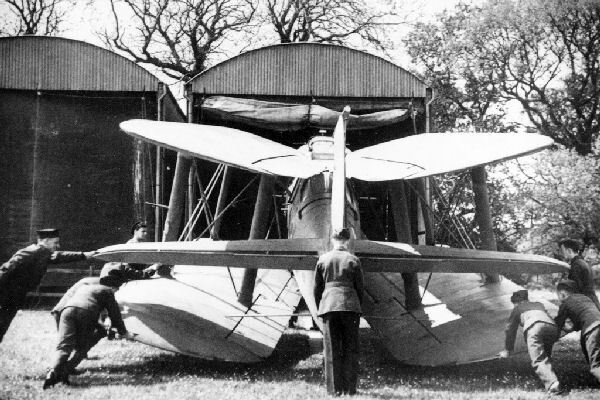 The Royal Navy set up 25 pairs of Dutch Barns which were widely dispersed around the site for aircraft storage - each barn could accommodate one biplane, wings folded. The station opened in June 1941, Lieut.-Commander A.E.Rose RN was appointed as Officer in Charge in late August when the Storage Section opened. Initially flying was restricted to arrivals and despatches of storage aircraft, the landing area was obstructed at all other times. What records still exist suggest that the station only stored biplanes, at least 16 Albacore, 12 Swordfish, 70 Walrus, and 1 Sea Otter. The first recorded arrival is that of Swordfish DK785 which arrived at the Storage Section November 20th 1941 having transferred from RNAS Lee-on Solent; it was only a short stay resident however as it was issued to 829 Sqn in February 1942. 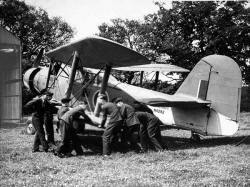 Beginning in the summer of 1943 Air Training Corps camps were held at Cowdray Park, ATC cadets were given instruction on aircraft and flying experience. Swordfish were used during the first camp, 29/30th June, and again on July 23rd. Walrus's took over ATC flying from July 27th. 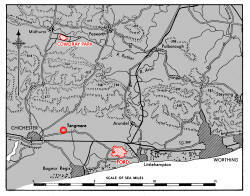 Further camps are known to have been held during 1943 on 2-4 Aug, 16-25, Aug, 6- 8, Sep. It is unclear whether ATC flying took place during 1944 but it shows up in records again but January 1945. Specially modified Lysanders of 161 Special Duties Squadron RAF trained at Cowdray Park on occasion, practicing their MPU (Mail Pick Up) technique. This involved a mail bag being suspended between two poles, 15 feet apart, and rigged with lights to give the pilot visual cues, the plane would approach at 30 feet, near stall speed, and a retractable hook snatched the mail bag. It is not clear when this training took place but it is most likely daring 1943. 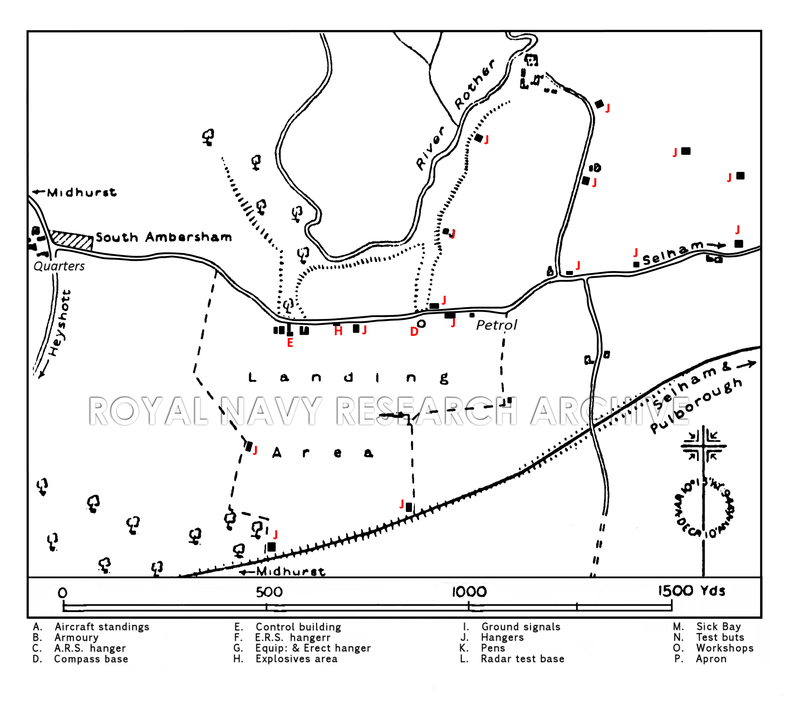 The landing area obstructions were removed in 1944 when the field was pressed into use by the RN Photographic Development unit from RNAS Ford. The unit's 4 Anson aircraft, the RN Photographic Flight, arrived in April to begin work; Ford had only recently returned to Admiralty control and was fast becoming overcrowded. They remained until returning top Ford in October 1944. The filed was also believed to have been utilised by Proctors doing circuits and bumps during late 1944/early 1945, presumably flying from Ford also - these may have been mistakenly identified as Reliants, 4 of which were present on the field during this time, one acting as a station flight. With the war in Europe over Cowdray Park was reduced to Care & Maintenance status by the end of May 1945, its aircraft all relocated to other stations. The station was finally Paid off and de-requisitioned September 30th 1945. 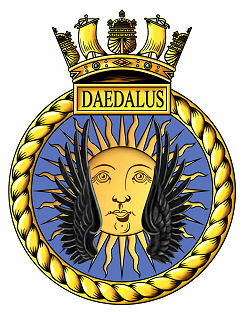 Note: Although listed as 'on books of Daedalus' in the CB 4368 A, Cowdray park has no separate entries in the Navy List under DAEDALUS (as Sandbanks & Lawrenny Ferry do) so there is no way to know which officers were attached to the Storage Section. Only two have been identified by name, Lt. Cdr A.E. Rose (ret) and Tempy. Sub. Lit. (P) RNVR J. W. C. Moffatt. The Airfield Information Exchange - AiX ARG. 2012. Cowdray Park. [ONLINE] Available at: http://www.airfieldinformationexchange.org/community/showthread.php?6712-Cowdray-Park&highlight=Cowdray+Park. [Accessed 09 November 13]. 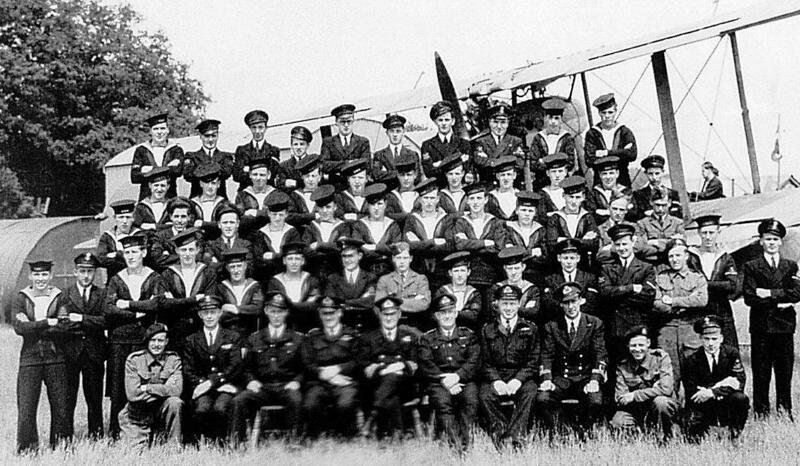 June 1944: The officers and staff of the Storage Section at RNAS Cowdray Park with one of the many Walrus aircraft held on the station. Above & below: Members of the Storage Section at RNAS Cowdray Park manhandling N4292 into a Dutch barn date unknown. This aircraft was despatched to Hamble in April 1945. 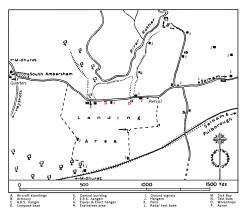 For the sake of accuracy and with several spelling errors in the description above, I add that AMBERSHAM and SELHAM are the correct spelling of these two hamlets. It would be good to see the errors corrected.